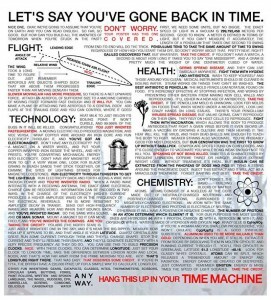 RatBoy’s_Anvil_2 posted the Handy Time Travel Tips chart. Please visit his page by clicking on the chart. Once there you can click on the chart again for a larger copy. The chart is a set of crib notes on some basic technological achievements up until the year 2000 or so. He suggests to hang this chart in your time machine. If you get stuck in the past, you may be able to capitalize on some of these achievements, or at the very least use some of these yourself to make yourself feel more at home in the past. Just be careful to not get busted for sorcery!